"No hidden fees of any kind, simply "Honest Pricing - all the time!" We can divide your annual heating bill into 12 easy payments, and you can pay each month. SHUT OFF THE GAS AT THE propane TANK. REPORT THE LEAK. call our office immediately at 717-933-9500. If you can't reach your propane supplier call 9-1-1 or your local fire department. You can’t taste or smell CO (Carbon Monoxide), but it is a very dangerous gas, produced when any fuel burns. If you suspect CO is present, act immediately! 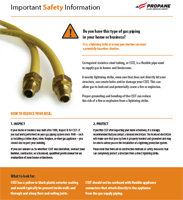 For more information, ask us for a Propane Safety brochure, or download a copy. Propane is produced during the separate refinement processes for natural gas processing and petroleum refining. It has a tiny carbon footprint and a lower carbon content than gasoline, diesel, kerosene, and ethanol. Propane has a very high efficiency and burns very cleanly. That means less maintenance and lower operating costs. Instant gas heat on a kitchen range gives you more precise temperature control and heat distribution. A propane tankless water heater costs about 60 percent less to operate than an electric unit while providing a longer-lasting stream of hot water. Air flow from a propane furnace can be up to 25º warmer than that generated by a heat pump, and the furnace life expectancy is 5–10 years longer. For more information on the advantages of propane, visit www.propane.com. When is a leak test/pressure test performed? In its natural state, propane is odourless. For safety precautions, an odorant called Ethyl Mercaptan is added so any presence of propane may easily be detected, smelling like rotten eggs or boiling cabbage. 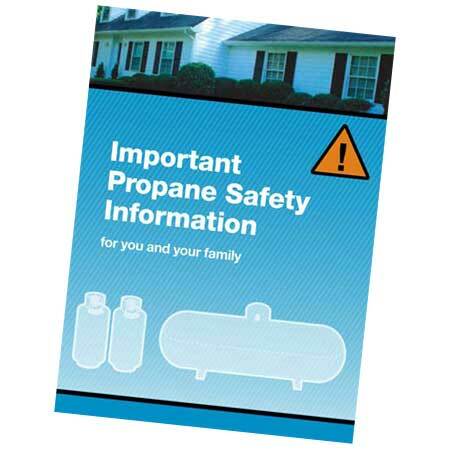 Note: Propane is heavier than air and is likely to collect in low-lying areas. When is the best time to purchase propane? Propane prices are affected mainly by supply and demand; therefore in the winter the prices are typically higher than in the summer. So Countryside Propane suggests that you fill your tank in summer. Should I Rent a tank or Purchase a tank? When purchasing a propane tank you are taking on the responsibility of maintenance which includes but is not limited to; rust protection and paint, valve replacement, and re-qualifications. One of the primary advantages of purchasing a propane tank is that the price per gallon of propane is significantly less than if you are leasing/renting a tank; and secondly you can purchase propane from which ever supplier you choose. What is the difference between DOT or ASME tanks? (DOT) Propane Cylinders for transportation are built to Department of Transportation specifications and their capacity is expressed in pounds of Propane. Popular DOT tank sizes are 20lb. grill tank, 100lb. often used for gas ranges, 420 lb. is equivalent to water capacity of 120 gal. (ASME) Propane Tanks for permanent installation are built to American Society of Mechanical Engineers boiler and pressure vessel standards and their capacity is expressed in US Gallons of water capacity, and they have gauges. Popular ASME tank sizes are 120 gal., 250 gal., 500 gal., 1,000 gal. Most sizes can be purchased above ground or underground. 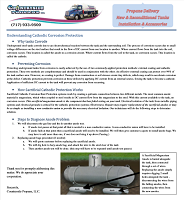 Propane tanks can only be filled to approximately 80% of their stated water capacity. How often does a DOT tank need recertified? DOT tanks are required to be recertified 12 years after manufacture date, and every 5 years thereafter. The re-certification by a qualified inspector, and proper paperwork filled out for each inspection are required. ASME Tanks do not require Re-Certification. How do I read the gauge/dial on my tank? The numbers on the dial of the gauge indicate the percentage of propane in the tank. The numbers labelled on most gauges/dials range from 10% to 95%. Note: The gauge/dial is designed to give you a general idea of what percentage your tank is at. The gauge/dial percentage may fluctuate some based on propane temperature. Because of that, propane tanks are not filled by monitoring the gauge, they are filled by the manufacturer installed bleeder. Countryside Propane LLC. recommends that you monitor your propane tank and request a refill around 15%-25% depending on the size of your tank. The numbers on the dial of the gauge indicate the percentage of liquid propane in the tank. The numbers labelled on most gauges/dials range from 10% to 95%. Note: The gauge/dial is designed to give you a general idea of what percentage your tank is at. The gauge/dial percentage may fluctuate based on propane temperature. Because of that, propane tanks are not filled by monitoring the gauge, they are filled by the manufacturer installed bleeder. Countryside Propane, LLC. recommends that you monitor your propane tank and request a refill around 15%-25% depending on the size of your tank. What maintenance is required on propane tanks? My Anode Test failed, now what? If the anode test failed, #1 Confirm there is a dielectric union installed to break the continuity between the gas piping and the tank. (Some systems may not require a dielectric union.) #2 If Step 1 does not correct the problem, then installing additional anodes may be required. Typically the Anode Bags attached to an underground tank lasts 15-20 years. Call us for additional information or to schedule a repair. What maintenance is required on Propane Systems? Don't EVER attempt to repair your own propane system! Always call a licensed professional. A Propane system consists of everything between the propane tank and the propane appliance. Regulators typically have a lifespan of 15yr. Check with regulator manufacturer to confirm regulator lifespan. If regulator is out of date or is not functioning properly, it is required to be replaced. Anytime maintenance is done to the system, the whole system is required to follow the current code. How do I relight my pilot? See manual for special lighting instructions. Note: We do not service or repair any appliances. We recommend that you do not attempt to light your own pilot. Any additional questions please contact Countryside Propane, LLC.